We conducted our systematic literature search in the Medline (via PubMed and Ovid) and Embase databases through December 31, 2012. We used theMedline Medical Subject Headings (MeSH) database and the Embase EMTREE thesaurus, as well as relevant article abstracts and metadata, to compile lists of controlled vocabulary and free text terms that were incorporated into our search strategy. Our search terms included keywords for the exposure (e.g., “postmenopausal” or “hormone” or “estrogen”), the outcome(e.g., “Alzheimer”), and study design (e.g., “cohort” or “case-control”). 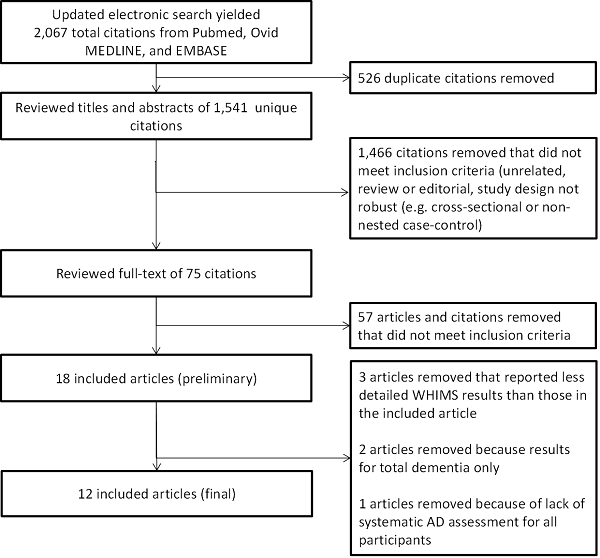 The search returned 2,046 citations from PubMed, Ovid Medline, and Embase; 526 duplicates were removed.We excluded 1,446 citations that did not meet our inclusion criteria (e.g., topic not appropriate, review or editorial, cross sectional or non-nested case-control study design), leaving 74 articles for full-text review. We then excluded 56 additional articles that did not meet the inclusion criteria, leaving 18 eligible peer-reviewed publications. We then excluded 3 articles that discussed WHIMS results published elsewhere in greater detail, 2 articles because they included results for all-cause dementia only, and 1 article because the study lacked systematic AD assessments for all participants. 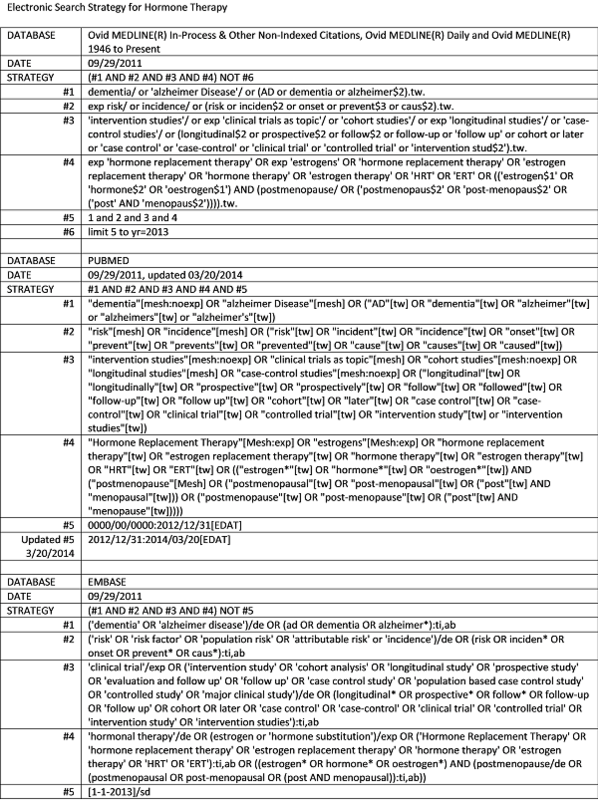 Thus, 12 articles are included in our Alzrisk review and tables. We ran an update of the search in Pubmed on March 20, 2014. The new search (which covered articles published between December 31, 2012 and March 20, 2014) returned 21 new citations. We excluded 20 citations that did not meet our inclusion criteria (e.g., topic not appropriate, review or editorial, mouse studies). One study was excluded after full text review because it did not meet inclusion criteria. No articles were added to our Alzrisk tables from this updated search. Some cohort studies produced multiple articles reporting on the association between alcohol use and risk for Alzheimer’s disease. To avoid presenting duplicate results, we reviewed such articles on a case-by-case basis and selected the most informative article(s) based on sample size, follow-up time, exposure assessment or modeling, and appropriateness of analytic methods. We included both Zandi 2002 and Shao 2012 because they reported on different lengths of follow-up time, and categorized HT exposure in different ways. Zandi 2002 followed participants for an average of three years, while Shao 2012 followed participants for an average of seven years. Zandi 2002 reported on any v. no HT use, duration of use (< 3y, 3 – 10y, > 10y), and current v. former HT use (current v. former also broken down by duration: <3y, 3-10y, >10y). Shao 2012 included comparisons for time between menopause and HT initiation as well as HT formulation. We included both Waring 1999 and Roberts 2006 because they reported findings from different follow-up periods. Waring 1999 includes women who developed AD between 1980 and 1984, while Roberts 2006 includes women who developed AD between 1985 and 1989. Furthermore, the two studies report results for different categorizations of HT use. Waring 1999 reported findings for duration of HT use( 6 months, ≥ 6 months) v. minimal HT, as well as cumulative dose (0 mg, ≤ 20 mg, 21-500 mg, > 500 mg). Roberts 2006 included results for duration of use (never, 0.5-3 years, > 3 years), total cumulative dose (never, ≤ 756 mg, > 756 mg), age at initiation (never, ≤ 49.5 years, > 49.5 years), and time between menopause of HT initiation (never, ≤ 2 years, > 2 years). Roberts RO, Cha RH, Knopman DS, Petersen RC, Rocca WA. Postmenopausal estrogen therapy and Alzheimer disease: overall negative findings. Alzheimer Dis Assoc Disord. 2006;20(3):141-146. Shao H, Breitner JCS, Whitmer, et al. Hormone therapy and Alzheimer disease dementia: New findings from the Cache County Study. Neurology. 2012;79;1846-1852. Waring SC, Rocca WA, Petersen RC, O'Brien PC, Tangalos EG, Kokmen E. Postmenopausal estrogen replacement therapy and risk of AD: a population-based study. Neurology. 1999;52(5):965-970. Zandi PP, Carlson MC, Plassman BL, et al. Hormone replacement therapy and incidence of Alzheimer disease in older women: the Cache County Study. JAMA. 2002;288(17):2123-2129.